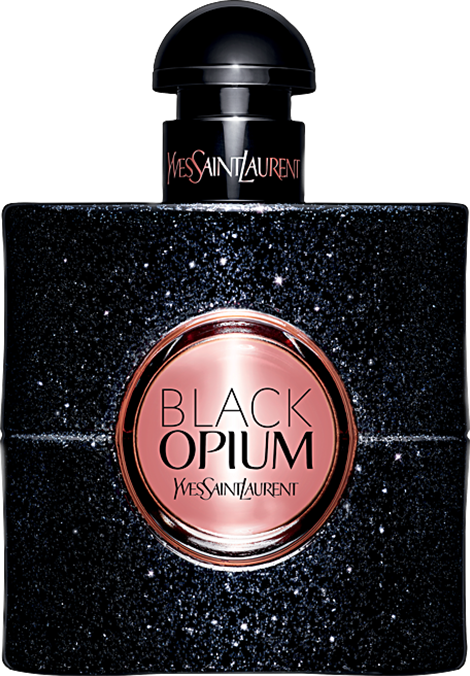 Black Opium is a new release from Yves Saint Laurent at the end of 2014. This scent is very feminine with no musky tones. It has floral and vanilla undertones and smells absolutely incredible. I was given this by my boyfriend for my 21st and you can get your hands on it from your local Boots in beautiful gift sets. Juicy Couture is an all time favourite for me and again I got this from my boyfriend for my christmas and I reckon this is my 4th bottle. If you're after a flirty, fruity scent this is absolutely perfect. 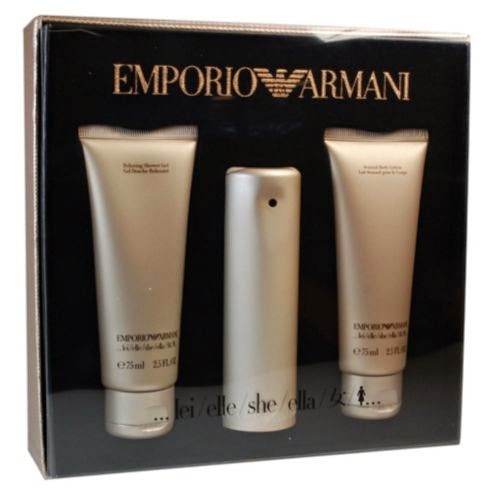 This retails at a reasonable price around £35 but Boots again do gorgeous gift scents which come with a handy pocket perfume vial for your bag- Perfect eh? 2014 for me had a few significant events- some positive and others not so great. 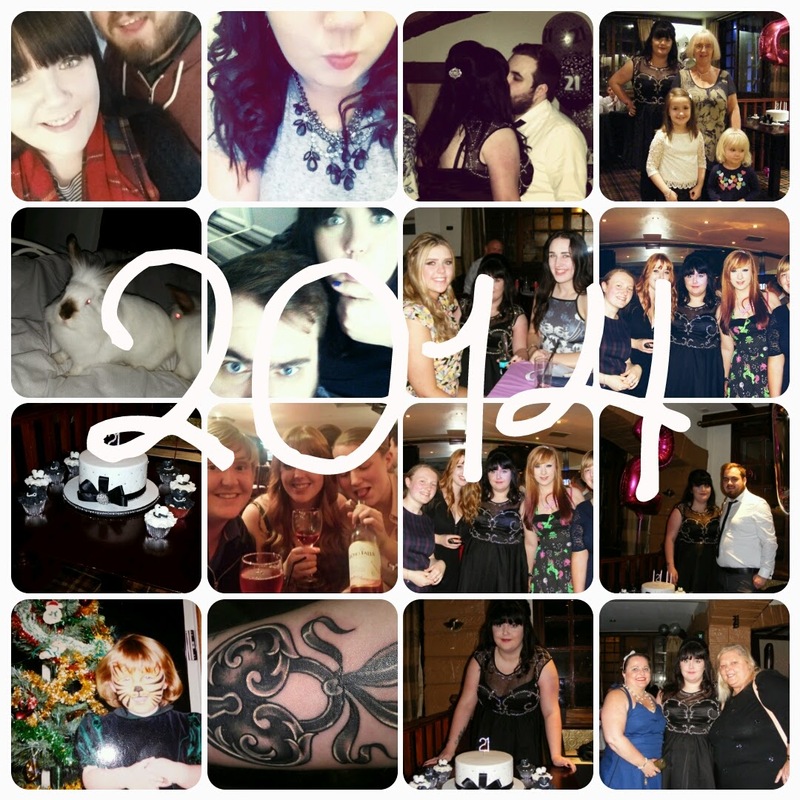 2014 for me held my best memories so far. I have three new tattoo's this year and I plan not to have anymore for the foreseeable future. Tattoo's for me shouldn't need to be planned far in advance as long as you know a reputable artist you are good to go. I met my boyfriend last year, who has slowly but surely became a very big part of my life. For someone who suffers with very bad nerves, I've met someone who makes me feel completely comfortable and cannot thank him enough for all that he's done for me. 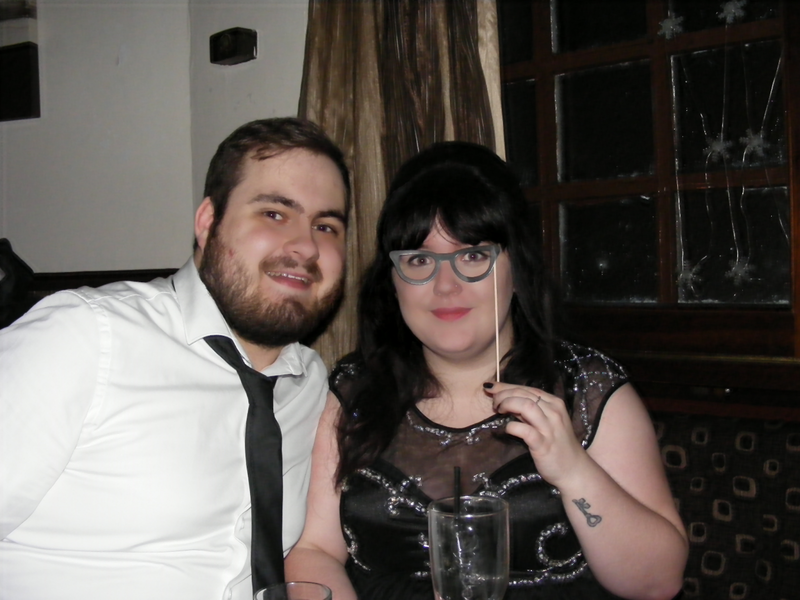 In October 2014, I celebrated my 21st along with Alan and my friends/family. My 21st was always a big worry in the broad spectrum of things, that was quickly resolved as soon as the night started my nerves settled. I started my HNC in Early Education and Childcare after 3 years of childcare related studies. I can safely say I think my time as a student is finished. I have the desire to go and find myself a job to manage for the big budget I have in my imagination. 2014 marked 3 years in Girl Guiding for me and inspired me to aim higher. I have thought about doing a post on my voluntary experiences, if you would like to see that comment below! I'd like to think 2015 is going to be the year for me, I can't predict the future but I am certain if it's similar 2014 it will be just perfect.. I have 7 all together! One on my inside left ankle, two on my left arm, three on my left and one on my back. 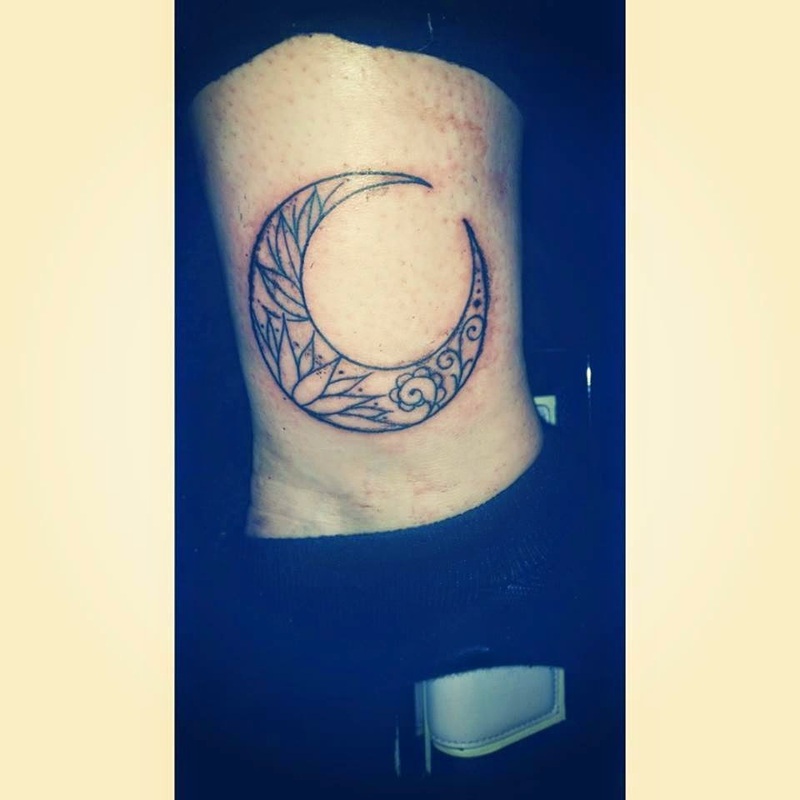 My favourite tattoo is probably a difficult question I have to choose between my crescent moon and my heart locket, both have meanings personal to me and I love them! I was actually 16 when I got my first tattoo. The legal age is 18, so I was a little bit on the rebellious side. 4. What do your parents think about your tattoos? My mum isn't all too bothered she came with me to get my first one. She's quite into the art and meanings behind tattoo's so she's quite easy going to be honest. Yes he does, at least I hope so. I haven't really asked what his favourite of mine is but he was with me when I got my recent crescent moon so possibly that's the one! I've always been fascinated by ink and the way people portray art on their skin and tell stories in pictures. I haven't had a specific inspiring source but I enjoy old school and traditional style tattoos. My most painful tattoo is most definitely the one on my inside ankle. Maybe because it was the first one I have had which was below waist level and on a particularly non-fleshy area. Not at this moment in time, no. But I'm still young and they're all relatively simple. Maybe in the future, I doubt it though. My least painful tattoo is probably the one on my back it was over within half an hour and is basic line work. 11. Who would you you like to tag? Everyone and anyone who has or enjoys tattoos. Leave your links below and I'll check them out! Here's a few things I have been loving in 2014 and a few hidden gems I've came across in the year! 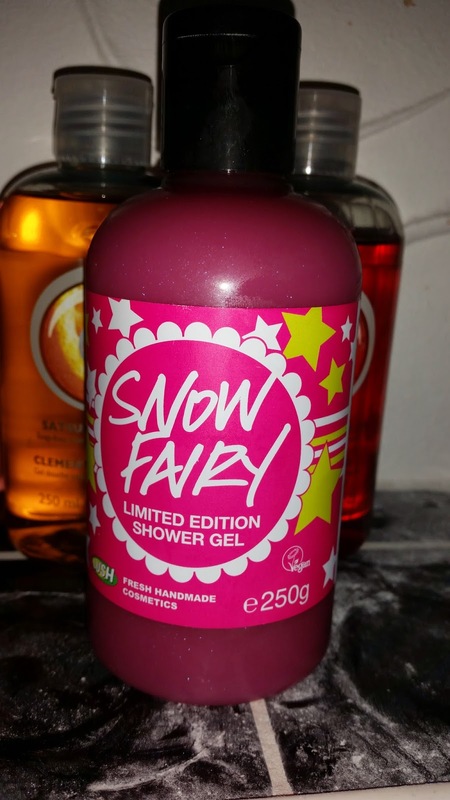 The obligatory Lush purchase on everyone's christmas list has to be Snow Fairy! I had to partially fight to get this online in the lush sales and ended up with three bottles. Sugary, candy heaven! 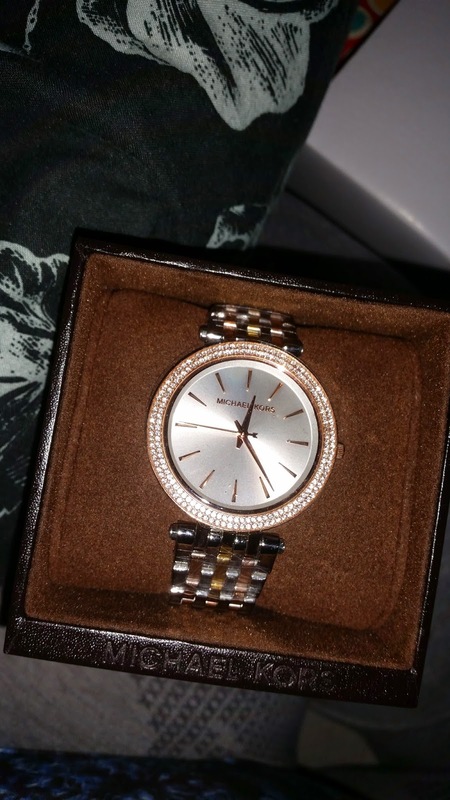 I mentioned in my previous post that I turned 21 in October and I received this beautiful watch from all my girls! I have wanted to purchase a Michael Korrs watch for so long and my wish was their command. 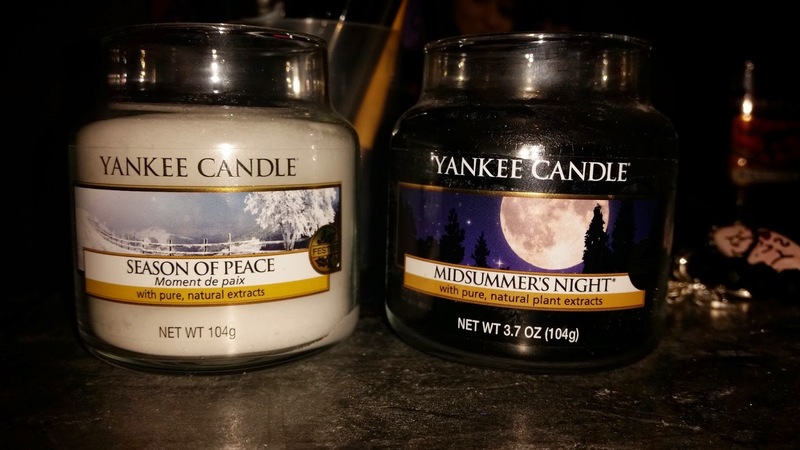 Yankee Candles are the Gucci of the candle world. Season of Peace the festive delight, was released in 2013 I believe and smells like heaven. Soft but strong scent with similar under notes to Clean Cotton by Yankee Candle. Completely opposite with my second choice of scent which is Midsummers Night, a musky almost aftershave like scent which smells amazing when lit. My favourite songs at this current moment one of which I wouldn't normally choose but I have had both songs on repeat for weeks. Taylor Swift- Blank Space has a catchy beat and I find myself walking about college singing it, I've never been a fan of Swift but she's got me good with this one. My second choice is one from my long time favourite Mr Ed Sheeran- One. This song has so many meanings and lovely connotations it's just a delight through my earphones. Firstly I would like to apologise for being away for so long and the lack overall of posts on this ramble page. In 2014 I have had a bit of a whirlwind year and it's probably one of my favourite years to date. The first few months of 2014 were a shambles and just overall not pleasant. Without too much story telling, I landed myself in HNC Childcare in June and shortly after met my wonderful better half. Frankly I couldn't wipe the smile off my face and felt like everything was falling into place. I have became a high end makeup geek and purchasing that plus any highstreet brands with my college funding (ssh!). I turned 21 in August and couldn't be more more thankful for everyone who turned up at my party and for those closest who listened to my moaning.. My new years resolution is to do more of what makes me happy and to value others. Twenty is Plenty ❤- Birthday Haul! Today is my 20th birthday! 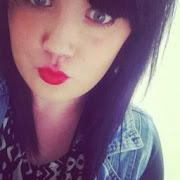 Yes I know I look about 12.. I have today for you my birthday haul which I got from my mum and dad. I have other bits and pieces but have included my favourite bits and bobs from my presents. As you can see here, I have a China Glaze Nail Polish in Purr-fect Plum. I had put this on my little list of presents I gave to my mum as I wanted to try out a China Glaze polish as I have yet to do so. This colour is has a pinkish purple tone and I think you can pick it up in Sally Beauty Supply. Next I got a NYX Jumbo Eye Pencil in Black Bean, which I am absolutely thrilled with. I have wanted one of these since I seen Chloe from Glitteralittle on Youtube talking about them. Last but not least in this photo, although its hard to make out I have an EOS lipbalm in Summer Fruits. I have tried this already as I couldn't wait to get it open. It is amazing! It has a berry sorbet like taste to it and moisturizes my lips perfectly. Also as you can see in the background of this photo, I have the Viva La Juicy perfume set, with the 50ml bottle and the lipgloss, rollerball and charm. I am so happy I have this scent back in my life. I love this perfume it's so fruity and girly. I am glad it comes with the roller ball instead of carrying the full size bottle around in my handbag everyday. Here I have my Black Oxford Converse! I have a pair already in the high top style although I would like a short pair to shove on with denim shorts or with jeans. I love these shoes! This present is basically my creative choice! I love drawing and all things arty so I thought I would get a Wreck This Journal for something to work on. The Wreck This Journal is a book which is designed for you to customize and make your own via different instructions and tasks on every page. I can't wait to try this out! These brushes have been on my shopping list forever and I just have never actually picked them up. I love Real Techniques Brushes and I can't wait to do my makeup with these before college! This is the Core Collection with the Foundation Brush, Buffing Brush, Contour Brush and Detailed Face Brush. I am most excited about the Buffing Brush due to the hype it has recieved! One of my bigger presents is the Primed For Lovin tin by Benefit. I am so chuffed that my mum picked this up for me, as I know that Benefit is one of the more expensive beauty brands. This tin has Porefessional Full Size, Benefit They're Real Full Size, High Beam Full Size and Mini Sugarbomb Lipgloss. I am glad I now have the Porefessional full size tube instead of the mini samples as I was afraid that they would run out! My favourite mascara as you know is They're Real from Benefit so the full size of that is also a bonus for me. Now I have saved the best for last for all you beauty fans! My lovely mum picked me up the Boots Beauty Advent Calendar as a last minute birthday present. She had heard me talking about it and I mentioned I was going to buy it but I was worried I would end up with no budget left for the rest of the month after bills etc. So I was lucky enough that my mum picked this up and saved me a pricey purchase. I cannot wait to open this and see what beauties are inside! Hello lovelies! First I have to make my apologies for not blogging the week or so. I have not had proper internet access which means I cannot blog unless I do it on my iPhone. iPhones are particularly useless for blogging as I can't edit and arrange the post in the way I wish on my phone. So here I am today, with my October favourites post for you all to check out! First off I have Nicki Minaj Pink Friday Eau De Parfum- I am in no way a big Nicki Minaj fan, but I am in love with this perfume. This perfume smells exactly like Viva La Juicy from Juicy Coture. I picked this up in my local Semi Chem store, for £25 for the 50ml. I have been wearing this perfume when I go out, or if I go to college and the bottle has lasted me exceptionally well. 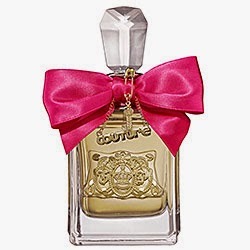 This perfume is sweet with flowery undertones, it has a hint of bubblegum also. The bottle itself highlights a typical Nicki Minaj style and personality. Next I have a recent purchase of mine which has already made it into my October favourites which is Righteous Butter by Soap and Glory. This is my favourite moisturizer for the winter months and is perfect for those that suffer dry skin and hands during the colder weather. Three cheek products are included in my October favourites- ELF Persimmon All Over Colour stick, Benefit Watts Up & MUA Blusher in Cupcake. I use the All Over Colour Stick to create a slightly tinted highlight on my cheek bones. It has a light peach shimmer to it which sits perfectly on pale skin. For £1.50 this is a definite re-purchase for me. The Watts Up Soft Focus Highlighter is also great for pale skin and an under brow highlight. As you have seen me talk about the MUA blush before I wont go into much detail, but this blush is highly pigmented and has a lovely light pink shade which suits pale skin perfectly. MUA also have won me over this month with Undress Your Skin foundation, I have this in the shade Porcelain. You can see a review for this foundation here! - This is my go-to foundation for days I am at college or in placement. The coverage is excellent and for £3 I reckon this is a must have bargain. I have also included the Superdrug Deep Anti Blemish Action Gel. I love this product for my current breakouts, it forms a gel coating over the blemish and treats it overnight. I cannot remember the exact price of this, although I reckon it was under £3. This product is perfect if you have somewhere to go and deadly spots appear overnight! Last but not least I have my favourite brushes for October, first brush you see is the ELF Professional Bronzing Brush which has been good for applying blusher also. It isn't too dense and makes it easier to blend out products with the contoured angle bristles. The black handled brush is something I picked up on impulse at my local Morrison's store. My local store have recently started stocking make up tools, after previously only stocking makeup products. This brush is the Powder Brush and cost me £2. I love this brush, it is soft and easy to work with. It picks up just the right amount of product and is easy to clean. This brush is slightly flatter than most powder brushes, it is more like a thicker rounded fan shape. I think this brush is perfect for shoving in my makeup bag when I'm going out and not worrying about loosing it. I want to give the rest of the brush range from Morrison's a try and see how they compare to higher end brushes. What products would you like to see on my blog?